Military Parade Cancelled, How Does Peace Movement Build on This Victory? On November 10, the day of the military parade, the ANSWER Coalition, part of the No Trump Military Parade coalition, had permits for both possible parade routes where peace advocates would hold a concentrated presence and rally alongside the parade. A work group was planning nonviolent direct actions, called “Rain on Trump’s Parade,” to stop the parade. On Sunday, November 11, a group of veterans and military family members were planning to lead a silent march through the war memorials on the mall to reclaim Armistice Day on its 100th anniversary. The No Trump Military Parade was building momentum. On Tuesday, we published a letter signed by 187 organizations that called for the parade to be stopped. It read, in part, “We urge you now to do all in your power to stop the military parade on November 10. The vast majority of people in the US and around the world crave peace. If the parade goes forward, we will mobilize thousands of people on that day to protest it.” We sent copies of the release to the corporate and independent media and made sure the National Park Service, DC City Council, and Pentagon were aware of our planning. On Thursday, the Pentagon leaked a new $92 million cost for the parade, more than six times the original estimate. The cost included $13.5 million for DC police for crowd control and security. This alone was more than the initial $12 million cost estimate for the total parade. DC officials noted the parade would “breed protests and counter-protests, adding to city officials’ logistical headaches.” Kellyanne Conway also took jabs at protesters when she discussed the cancellation of the parade on FOX and Friends. Coalition members were quickly alerted to the new cost estimate and people went on social media spreading the word, expressing outrage and sharing our sign-on letter. That afternoon, the coalition issued a statement on the cost and the momentum building to oppose the parade, as by then, more than 200 organizations had signed on. That evening it was announced that the parade was postponed for 2018 and would be considered in 2019. There was super-majority opposition to the military parade and it was becoming the national consensus of the country that there should not be a military parade. Army Times conducted a poll of its readers; 51,000 responded and 89 percent opposed the parade responding, “No, It’s a waste of money and troops are too busy.” A Quinnipiac University poll found 61 percent of voters disapprove of the military parade, while only 26 percent support the idea. In addition to the financial cost, the Pentagon knew there was a political cost The cancellation is a victory for the No Trump Military Parade Coalition, but also a victory for the country – glorifying militarization was exactly the wrong direction for the country to be going. How Do We Build On This Success? Continue with the plans for the weekend. The Reclaim Armistice Day silent march will still be held. This is the 100th anniversary of Armistice Day, also known as Remembrance Day. It marks the end of World War One, which ended at 11 am on the 11th day of the 11th month, in 1918. A two-minute silence was held at 11 am to remember the people who died in wars and reflect on the horror of war and the need to work for peace. It was changed to Veterans Day in 1954. The Reclaim Armistice Day march will begin at 11 am at the Washington Monument. Help build the Women’s March on the Pentagon. 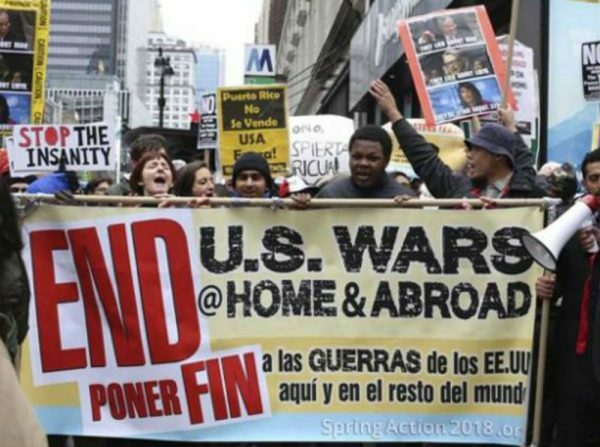 The march was called for by Cindy Sheehan, whose son Casey died in the Iraq War, to put an antiwar agenda back on the table. The march is being held on the anniversary of the 1967 march on the Pentagon when 50,000 people marched in opposition to the Vietnam War. Make war, militarism, and military spending an issue in the 2018 election campaigns. People can ask all candidates about the never-ending wars and the record spending on the military budget, now approximately 60 percent of federal discretionary spending. Stop military escalation with Iran. This week Mike Pompeo announced the Iran Action Group, almost exactly on the anniversary of the CIA-led coup against Iran’s elected Prime Minister Mohammad Mossadegh in 1953. This is part of a broader escalation, eg. the CIA created an “Iran Mission Center” in January. The Trump administration has been working to destabilize Iran, scapegoating Iran and to “foment unrest in Iran.” John Bolton was promising regime change in Iran before he became National Security Adviser. Trump violated the nuclear weapons treaty by withdrawing for no cause. This new effort will intensify efforts to foment unrest in Iran, the peace movement should work for de-escalation and normalization of relations with Iran to prevent another war-quagmire. End the longest war in US history, Afghanistan. The Trump administration has escalated US involvement in the war in Afghanistan. This 17-year war has been one of constant failurebut now the US is losing badly to the Taliban which has taken over more than 50 percent of the country and can attack Afghan forces in the capital, Kabul. It’s time to bring the troops home from Afghanistan and Iraq. Stop the US and Saudi Arabian slaughter and starvation of civilians in Yemen. The forced famine and cholera epidemic killed more than 50,000 children last year, a US-approved genocide. The silence in response to this unauthorized war needs to end. The recent bombing of a school bus of children with US weapons may help galvanize the public. End escalation of nuclear weapons, extend the nuclear weapons treaty and work to rid the world of nuclear weapons. The US has embarked on a massive upgrade of nuclear weapons, begun under President Obama and extended by Trump. A year ago, the UN announced the beginning of a process to ban nuclear weapons. The Trump-Putin meetings should continue, despite the Russiagate allegations, and include ridding the world of nuclear weapons. These are just some of the conflicts deserving attention. There are of course, more, e.g.cut the outrageous military budget, stop the militarization of space, end the war in Syria, remove troops and bases from Africa, negotiate peace with North Korea, create a detente with Russia, end support for Israeli apartheid, stop the economic wars and threats of militarism against Venezuela and Nicaragua, and deescalate-don’t arm Ukraine. While many groups have their own focus, what can a coalition campaign work together on? We have been calling this fall the Antiwar Autumn because there is so much going on. Even with the cancellation of the military parade, it is going to be a busy fall. The Veterans for Peace annual conference in Minnesota, August 22-26. 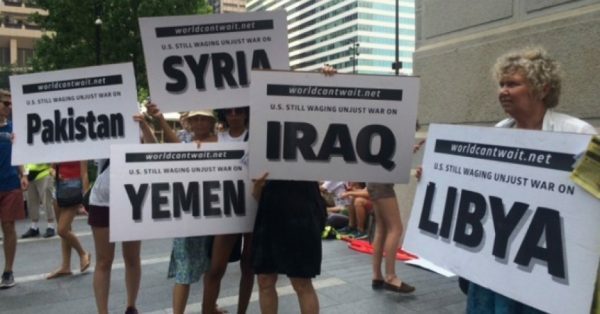 On August 25, the Chicago Committee Against War and Racism is holding a protest against war and police violence on the anniversary of the 1968 protest at the Democratic National Convention against the Vietnam War. 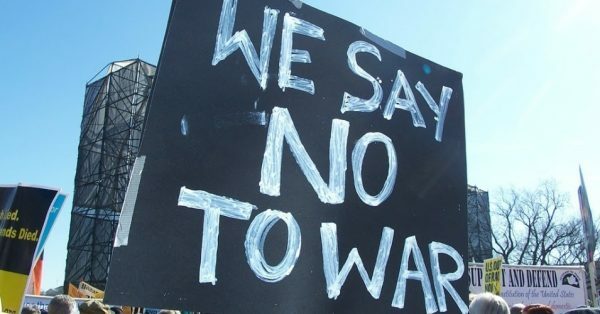 The World Beyond War #NoWar2018 conference in Toronto, Canada on September 21-22 on how to re-design systems to abolish the institution of war. The October 21 Women’s March on the Pentagon. The effort to reclaim Armistice Day march on November 11. The Coalition Against US Foreign Military Bases’ first international conference in Dublin, Ireland on November 16-18, 2018. Beyond these activities, what can we do to build on the successful organizing around stopping the Trump military parade? We need to celebrate this victory and build on it. We also want to highlight Class 7 of the Popular Resistance School on How Social Transformation Occurs, which focuses on the infiltration of political movements by the government, big business interests, and other opposition groups. We have written in the past about infiltration, i.e., Infiltration to Disrupt, Divide and Mis-Direct Are Widespread in Occupy and Infiltration of Political Movements is the Norm, Not the Exception in the United States. In this class, we broaden those discussions but also examine how to deal with infiltrators and informants.